This weekend, my roommates and I took the plunge and adopted a cat. 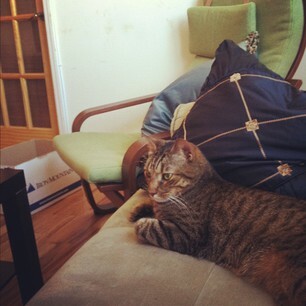 This is Nestor, a three year old Tabby male. He was found abandoned on the street and the original shelter that found him was going to euthanize him as he was very unfriendly when they found him. Luckily, the Empty Cages Collective of Brooklyn took him in and helped him adjust to people. After his first night under my bed, Nestor has really adjusted to our apartment. He has been following me around all day! I can’t imagine a sweeter cat, he is enjoying being curled up next to me. Having a cat is going to be a pretty big adventure, but I am ready for it.